With our fully adapted vehicle we are able to provide driving tuition to our disabled clients. We are recommended by the county's leading vehicle adaptation specialists, All Shropshire Mobility. We can provide driving tuition to all clients that are over the age of 17 (16 if in receipt of enhanced rate mobility DLA or PIP). Alpha Automatic Driver Training is specialist provider of training for clients with Specific Needs. I run a modified Vauxhall Meriva Automatic suitable for a wide range of disabilities. I'm also able to arrange training in your own car if the modifications needs are extensive. I understand that your situation is individual to you so please contact me on 01743 240283 or my mobile 07940 328203 (if you contact me on the mobile I'm not always available to talk e.g. if I'm in the middle of a lesson). to discuss you individual requirements. I can offer advice on a no obligation basis. No hard sell! Wheelchair users, In order to make you as independent as possible I can help you with training to transfer yourself from your wheelchair to the driving seat. In your own car there are many options for you to achieve this including transfer boards, various hoists and roof box mounted lifts. There is also the option of driving from your chair. Please contact me if you are having a WAV built to learn to drive in, a dual brake could be fitted at the same time to help you learn safely (Motability will often supply this if they are supplying the vehicle and driving tuition). Rehabilitation/Occupational Therapists, I can work with you to arrange for your client to either learn or return to driving, I can offer help and advice if your client needs a Driving Mobility Assessment or a DVLA/DVSA Driving Appraisal, I work closely with and receive referrals from Regional Driving Assessment Centre, Birmingham & Shrewsbury and North Wales Driving Assessment Service, Bodelwyddan & Newtown . I'm also are registered with Motability to carry out Adaptation Familiarisation under (Motability Managed Adaption Program (MMAP) Funded tuition and the Motability learner driver scholarship. Cowal Twin Flip Left Foot Accelerator, you pull down the Accelerator pedal you require. Lodgesons Infrared Secondary control Allows Indicators wipers and lights to be switched on from steering wheel. Left leg disability - My automatic can be driven in 'standard' auto mode just using your right leg. Right leg disability - the typical modification for this is a left foot accelerator. If you are 'new' to driving this modification will be as easy to cope with as using you right leg. If you are returning to driving then this modification will take some getting used to. We recommend a minimum of 10 hours to learn to cope with the 'clutch reflex'. 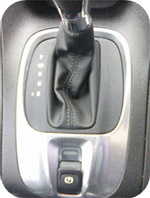 Both leg disability - this is likely to require hand operated controls for the accelerator and brake. My car is fitted with a right hand operated single combined push-pull lever (with integrated indicator switch). This, used in combination with a steering ball and Secondary control unit, will give you full control of the car. Please contact me to discuss if you would like to drive using a different type of control or if you also have a disability of the arms. One arm disability - the use of a steering ball (or lollipop if required) will give you full control of the steering. My car is also fitted with a secondary control unit to work the wipers, lights, horn etc so that you can keep you hand on the wheel at all times. Modifications could also be made to the weight of the power steering if strength is a concern. Both arm disability - modifications start to get more complex in this area. My car requires the use of at least two limbs (2 arms or 1 leg & 1 arm). Call me to discuss your individual situation. It is likely that training would need to be carried out in your own car. Deafness - I don't consider this a disability from a driving point of view. The issue is communication when learning to drive. We are experienced and patient and will introduce you to a range of hand signals and prompt cards to help you learn safely in either a manual or auto. I also have a digital hearing loop for those with hearing aids. The above is just a guide to the general situations I can cater for. As long as you have some range of movement that are under control, can pass the theory test and have eyesight that meets the DVLA requirements YOU CAN LEARN TO DRIVE! Wheelchair users, In order to make you as independent as possible I will help you learn to transfer yourself from your wheelchair to the car seat. In your own car there are many options for you to achieve this including various hoists and roof box mounted lifts. There is also the option of driving from your chair. Please contact us if you are having a car built to learn to drive in as a dual brake could be fitted at the same time to help you learn safely (Motability will often supply this if they are supplying driving lessons). Occupational Therapists, I can work with you to arrange for your client to learn or return to driving. We are registered with Motability to carry out adaptation familiarisation and the young driver scholarship.